How Do I Compare Different Golf Clubs? A great starting point is talking to other golfers of similar build and skill level, then consider a professional swing analysis and fitting. When you compare different golf clubs, you may be comparing the same type of club by different manufacturers, or you may be deciding on which fairway woods, irons and hybrids to carry in your bag. The key is to have clubs that have a 10 or 15 yard difference between them, so you will have coverage for the course. Either way, the best way to compare different clubs is to take them to a driving range and try them out. Go to a golf retailer and have your swing speed measured. Most golf specialty shops have launch monitors that can accomplish this. Make sure the clubs you are trying out are fitted for your stature and swing speed. If your swing is slow (70 to 80 miles per hour), consider larger club faces and flexible shafts. Try drivers with different lofts to see which one works best for you. For high handicappers, a driver with a loft of up to 13 or 14 degrees may be required to get suitable distance. For more advanced players with faster swing speeds, a driver with a loft of 9.5 or more can work well to provide accuracy. If you slice the ball, try a driver that encourages a straight ball or a draw. Hit some fairway woods like the 3-, 5- and 7-wood. If the 3-wood is difficult for you to hit off the ground, try the 5-wood and 7-wood. The higher loft of these clubs makes them easier to hit. Try out a 3- and 4-iron, and if you are having trouble hitting them, you might consider replacing them with a couple of hybrids. Take a 3- through 6-hybrids to the range to see which ones you like in place of the long irons. 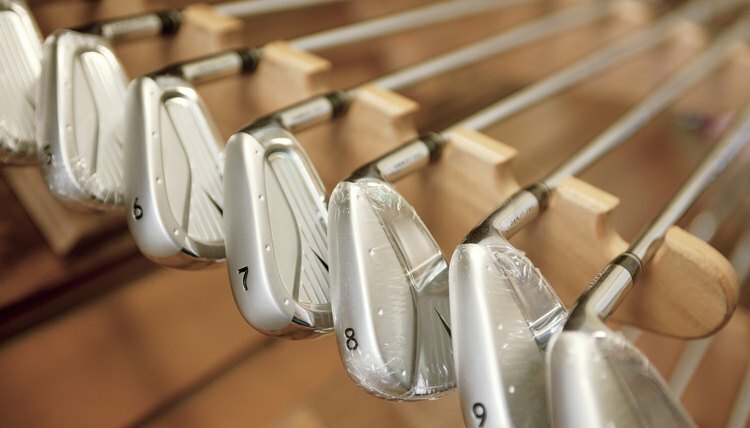 For example, to replace a 3-iron, consider a hybrid club that has a loft angle of 20 to 22 degrees. That should achieve the same distance. Some golfers also use hybrids to replace the 5-iron.